Recent advances in the field of induced pluripotent stem cells have got to the point where we can using various methods convert adult stem cells back to a state where they are pluripotent. I am not going to go into the details of these methods or much of the repercussions of this as these can be found much better at other sources - such as here and here and here. Essentially I wanted to play devil's advocate here for a second with one thought that came to my mind. Now don't get me wrong I am all for stem cell research, and in fact I do not have an issue with the use of embryonic stem cells under reasonable conditions - especially in the case of those that are spare or to be wasted from IVF treatments. The interesting thought I had in regards to this issue is, how do we know that these adult stem cells have been made to be pluripotent? One way is to let the cells develop and multiply and see what happens. Although this is not exactly what is done in the study (actually the nucleus of the stem cells was put into a blastocyst) it is for all intents and purposes the same effect. Well... they develop in to an embryo of course. Which brings us back to the beginning of that what we have done is use adult cells to create embryonic cells, which not only defeats the purpose of not using embryonic cells but is basically cloning. Does this really solve the image problem that stem cells have? 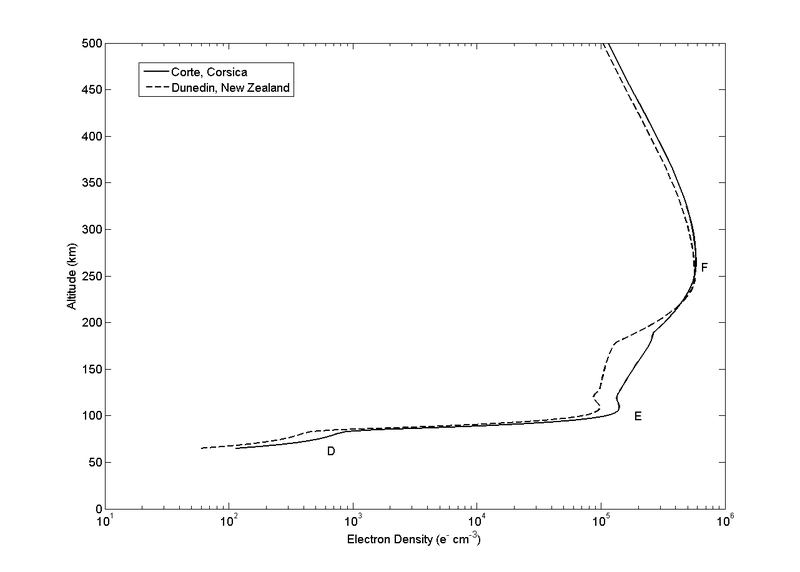 As a ionospheric/near-earth-space physicist by training, I have published a few papers (mostly as co-author but one as a first author) in the geophysics journals that service this field. But recently I have also had a very different experience being a co-author on a paper that resulted from some work I have been doing in psychology. The psychology paper, which is a really good study which shows interesting and possibly profound results (on which I will write more when it actually hits the dead-tree and/or pixel press), has just been accept after numerous submissions (and even more rewrites) to various journals. This contrasts hugely with my experience in publishing in the geophysics journals, where although the reviewers have sometimes wanted substantial changes, I have not had a paper of mine rejected, and very few of those of my supervisors (none that I can immediately recall) have been rejected. That might imply that the journals we usually publish in such as the American Geophysical Union run Geophysical Research Letters (2008 Journal Citation Reports (JCR) impact factor of 2.959) and the more specific Journal of Geophysical Research A: Space Physics (2008 JCR impact factor of 3.147 - though this is for all 7 parts of which Space is only one) accept almost everything for publication (as an illustration in the last 5 weeks there have been 49 papers published electronically in JGR-Space), but I don't think that is the case. I suppose with Psychology being such are large field, as is Physics, that the more general journals will get huge amounts of submission and to be the best you only want to accept the best so there will obviously be more rejections in these types of journals rather than the more sub-field specific journals I have been used to. As a counter point to the impact factors of the geophysics journals above I guess it is only fair to compare these to the journals the psychology study was submitted to: Nature (would have been nice but we did not expect to get accepted) JCR impact factor of 31.434, Cognition 3.481 (there may have been one or two more but I can't be sure) and Experimental Brain Research (where it is being eventually published) 2.195. I would be interested in hearing any other stories of experience publishing in various fields, so don't hold back. In the good tradition of any scientific article with a question as a title the answer to the question posed in this title is no. The reason for bringing this up is that in the Lifestyle section, published Friday, under the banner of Body and Soul, of the Otago Daily Times (ODT) was an article about a mother in Wanaka who was starting a cosmetics business from her kitchen. Susan Helmore is not a chemist, a herbalist or a computer whizz - although she says she's fast becoming a "geek". She makes lists, has an indexed bright-ideas book, Google is her "friend" - and there's peanut butter on her lap top. Her passion is chemical-free skin-care and cleaning products. I am all for people having good ideas and making a business and a living of their own abilities. But this is clearly not a good idea. Why I hear you asking, well let me explain. The problem rests on the word chemical. Everything in the universe is a chemical, whether it be an element, a molecule or a compound. So water is a chemical, oxygen is a chemical, as is sodium lauryl sulfate (one of the main ingredients in most soaps and body washes). So for something to be chemical free it has to have nothing at all in it - in other words it is a vacuum. This is a fallacy that comes up quite often from people who claim to be using "natural" solutions that are chemical free, both in the terms of cosmetics and cleaning products like here but also things like organic farming, which also claims to be a chemical free process. Yes some people have allergies and will react badly to some chemicals, but that does not mean that chemicals are bad, and the are certainly not avoidable. Diagnoses like MCS (Multiple Chemical Sensitivity) are rarer than even people who believe they have them think. Substances like detergents and soaps need to contain certain classes of chemicals such as surfactants so that they can react with both the water and the grease, or else they will not work. So what ever the source of the chemicals be them synthetic or "natural" they still must perform the same job in the same way, and so will in all likelihood have the same interactions with the body. Now that the hectic period of writing up my thesis is over, resulting in somewhat of a blogcation, I thought that it was high time I shared some of the research that went into my thesis. The ionosphere is a region of plasma in the upper atmosphere, it extends from about 50 km on the lower end to more than 1000 km at the top. Mostly the plasma is created by radiation from the sun, which breaks up (dissociates) the atoms, i.e. ionises them, into electrons and positive ions. A small part of the ionisation is created by cosmic rays, and particularly at the lower altitudes where the neutral atmospheric density is higher the electrons can collide with the neutral atmosphere to form negative ions. The ionisation density depends both on the rate of input from the sun or other sources (dissociation rate) and on the rate at which the ionisation decays by recombining to form neutral atoms (recombination rate). Now the ionosphere is not really a layer in the atmosphere like the troposphere and the stratosphere which are defined by temperature, but rather is a region in which the plasma is overlayed over the top of these temperature variation defined layers. So the ionospheric altitudes are the same as those covered by the mesosphere and the thermosphere. Different frequencies of solar radiation interact with different molecules or atoms in differing regions of the atmosphere to create several layers within the ionosphere. The peak density of ionisation is in the F layer, above 200 km in altitude, which is due to extreme UV solar radiation ionising atomic oxygen (O). Below this there is the E layer, around 90-120 km in altitude, due to soft X-rays and UV ionising molecular oxygen (O2). Below this is the D region, not a true layer like the E and F, but more of a bump in the slope of the electron density profile. The D region is 50-90 km in altitude and is mostly due to Lyman-α ionising nitric oxide (NO). Since most of the ionosphere is due to the sun, we see variation between day and night and between the seasons as well as over different latitude ranges. In the image you can see the difference between a summer ionosphere and a winter ionosphere, with the electron densities displayed for Corsica (summer, solid line) and Dunedin (winter, dashed line) in late July. By having all these electrons (and ions) up in the atmosphere, the physical properties of the atmosphere are altered. In particular the electrons are very good at doing what they do in copper wires, conducting electricity. This presence of conducting layers in the atmosphere reflects radio waves, forming a "leaky" or partial mirror. In fact the first direct evidence for the existence of the ionosphere came in mid-December 1901 when Guglielmo Marconi informed the world he had received radio signals at Newfoundland, Canada, sent across the Atlantic from a station he had built in Cornwall, England. Differing frequencies reflect off differing electron densities (and hence conductivities) at differing altitudes in the ionosphere. My work was focused on VLF (Very Low Frequency, 3-30 kHz) radio waves which reflect of the D-region. Higher altitude regions can be studied using higher frequency radio waves. VLF radiation, as well as some other frequencies, reflects not only off the ionosphere but also off the surface of the Earth (very well off sea water, not so well off land, and very poorly off ice, depending on the conductivities of these surfaces). The result of this is that the radiation can travel long distances (>10000 km for powerful transmitters) reflecting between the Earth and the ionosphere, like it was travelling in a waveguide. This allows us to observe radio waves at a receiver and infer the condition of the ionosphere between the transmitter and the receiver. Changes in the received signal are caused by changes in the ionosphere (or extremely rarely the ground), and by comparing the observed changes to expected changes from computational modelling, you can get a indication of what processes are occurring in/effecting this altitude range and the relative importance of the processes. The ability to remote sense the 50-100 km region of the ionosphere using VLF radio waves is very useful, since this altitude range is too high for direct observation by plane or balloon, and too low for in situ measurements by satellites. Rockets have been used to study this region but those measurements are transitory and relatively expensive. Of course operating large, powerful VLF transmitters is also expensive (especially since they usually have low transmission efficiencies ~10-20%), but fortunately for the world of science, many governments have undertaken to operate such transmitters (usually for the purpose of maintaining communication channels with submarine fleets). The US, Russia, Japan, China, India, France, Germany, Italy and the UK all have (or used to have) such transmitters. Radio waves in this frequency range can penetrate tens of meters into seawater allowing communication (even if simple communications with a low baud rate, due to the VLF carrier frequency) with submerged submarines, so that the submarines do not have to surface and give away their position. This network of transmitters in conjunction with similar networks of scientific receivers allows simultaneous coverage of much of the Earth's ionosphere (at least at D region altitudes). A few years back the University of Otago started a Master's course in Science Communication, and the fruits of that are starting to come to bear. This weekend six films by Science and Natural History Filmmaking students will be shown at Dunedin's Regent Theatre. According to the Centre's website the films will constitute a part of the student's thesis. I think that this is a great idea, and you can specialize in the above film-making, creative non-fiction writing or a general popularizing of science. I think that more people should be taking an interest in that... but then again I am a science blogger and now part of the Science Media Centre's Sciblogs.co.nz set up so maybe I am biased. That is not to say that I can't have concerns about some of the outputs of this venture, an article online at the Otago Daily Times highlights one of the videos being screen about the 1080 poison debate, and I think it illustrates just how easy it can be to miss the point of communicating the science. Sure it is good to get subjects such as this out in to the public (not that this one is not already out there) but the goal must be first and foremost to tell the science's story. So below is a rant that I left as a comment on the article that I think deserves wider audience and discussion. I find the paragraph about balance interesting coming from students of a science communication course. Mr Holmes said while many films had been made on 1080, they were mostly one-sided, so their aim was to make a "balanced" account of the issue by presenting both sides of the argument alongside the science. As they say they present both sides of the debate along side the science. But the key point is not the politicization of the issue or the various points of view but the facts, which are the science. And while the students do mention this, It's a very emotive subject and some facts get lost in the argument , it does not seem from the article as if this is what they have achieved. Sure giving the balance adds to the drama and emotion but it detracts from the aim of what they are trying to achieve. The point of their course is to teach them to communicate the science. I appreciate the need to have a "hook" upon which to attach the science and to have a narrative that brings the viewer along. But science is not about balance, it is a one sided process that involves the facts. Personally I do not have all the information to make a decision on this situation, although I do have my opinions, and if the intent of this film is to communicate the science and to hence give the information that is needed to make a decision then give the rhetoric of either side (or both sides for that matter) is not going to help that process along. The goal of science communication should not be to start debates but to provide the public access to the information that settles the debate. The communication is not, as Mr Ting seems to think, about getting the two sides of the debate to talk together but to get the correct information out to where it can be accessed by all, removing the need for a debate. But why spend all this money on sending humans into space, it is dangerous, and relatively pointless, and robots can do so well without us there. Well firstly there is at present a limit to what robots can do either on there own or with our help, problems such as they are generally designed with a specific purpose, where as a human in the same situation is much more versatile. But the most important reason is that on this pale blue dot of ours there is a limited amount of resources and indeed time. At some point or another in the next 4 or so billion years that it has remaining, the Earth will no longer be able to support us and we will need to be somewhere else if our species is to survive. To that end we need to now begin the efforts of seeding the stars with populations of Humans (and for that matter cattle and grains etc. you know things that we will need to survive). So by all means use the robots to find out where we can go and how we can get there and what we will find when we get there, but remember that the Earth is the cradle of humanity and one cannot stay in the cradle forever. One of the trends in modern skepticism groups that has been developing across the world is to get together and have a few drinks of choice. The Skeptics in the Pub concept has recently made it to New Zealand and groups have been meeting up in Auckland, Wellington, Christchurch and now Dunedin. My local Dunedin chapter is only a few days old and is light on people so if you are keen click the link and sign up. Of course if you are far away from New Zealand's premier centre of learning go to the main national page (or the links above) where you can find the groups in the bigger cities or even start your own in your town. With spring coming to the southern hemisphere, the blossom and the daffodils are out and the weather is definitely warmer (OK some of the time). But there is a also something bad that also happens, as the sun rises over the polar horizon, and the polar vortex (winds that rotate about the pole) begins to shut down for the summer there is a large patch of stratosphere which has been enclosed in the polar vortex that has an appreciably lower Ozone content. This Ozone "hole" breaks up with the shut down of the polar vortex and regions of lower Ozone content spread out over parts of the southern hemisphere as the two regions diffuse into one an other. What this means for us that live closer to the South Pole than the equator is that around the time of the southern vernal equinox we tend to get a period of very low ozone over head. 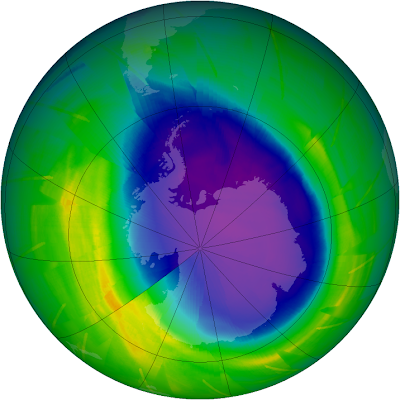 So in honour of this and the dangers it can present, I have a series of posts on Ozone. Firstly, some basics. The Ozone hole is not a region of no Ozone (which is the reason for the scare quotes in the above paragraph) but merely a region of lesser density of Ozone. The hole is defined as a region of Ozone less than 220 Dobson units (DU). This level was chosen as the reference since ozone levels had never been seen lower than this before 1979. Ozone itself is a relatively unstable allotrope of oxygen (O3). It forms when UV radiation from the Sun breaks the bond between the atoms in the O2 molecule, some of the liberated oxygen atoms then bond with other O2 molecules making O3. This same interaction with UV radiation also breaks down the O3 and it is these two together that are responsible for the UV protection we get from the Ozone layer. Ozone is unstable and quite reactive, especially with molecules containing nitrogen, hydrogen, chlorine, or bromine. That is enough for today, next in this series we will look at how the Ozone hole has formed and what we have done about it. This has to be what I would call one of the worst in terms of despicable advertising practices. Literally it is designing your advert such that it resembles an article in the newspaper/magazine, and usually the only way to tell is there is the word advertisement in very small text at the top. This is making it seem like the newspaper condones and supports the issues the author is raising, giving his/her position more authority than an opinion piece would. And strangely enough those that practice this deceptive form of advertising seem to be those that are already attempting to deceive people (or themselves) in other ways about the quality of their product or service, such as alternative medicine (alt med) providers. Now this might seem a tad harsh on alt med people, but then if the alt med had been shown to work, then it would not be alternative medicine but rather simply medicine. One recurring example of this practice is seen in a local free weekly (one of many my locale seems to have) I get in my mailbox The Star (digital online version can be found here). Almost every week without fail either on page 3 or 5 (usually at the bottom right) there is an advertorial by a local chiropractor - laying down how we should manipulate our spines to prevent swine flu or some such (perhaps I will scan some in point you to the online version find them on the chiropractor's website and deconstruct them at some point in the near future - it seems just to richer source of fodder to ignore). Here are some of the latest developments in the world of healthcare, with chiropractic commentary from Dr Tat Loo. Tat also contributes occasional feature articles and commentary for the weekly Dunedin based paper The Star which we will be included on this page. This is exactly the sort of deception which is being practiced in these advertorials trying to pass off ads and opinion as "feature articles". Any way enough for now... enjoy your weekend, I think I will spend some time looking at the relevant acts and laws regarding false advertising. The advice given on the outside of the book that gave Douglas Adam's "trilogy" its title (I mean of course the "Hitchhikers' Guide to the Galaxy") is always a useful thing to keep in mind, especially in the days of media sensationalism. Today's worrying threat is a Tsunami, and like I said above I don't want you to panic, and that is for a couple of reasons, the first one is - you may have missed it already (The Pacific Tsunami Warning Centre in Hawaii's updated timings for the arrival of a tsunami in New Zealand are: East Cape at 9.44am, Gisborne 10am, North Cape 10.12am, Napier 10.40am, Wellington 10.50am, Auckland (east coast) 11.12am, Auckland (west) 11.39am, Lyttelton 11.55am New Plymouth 12.17pm, Nelson 12.23 pm and Dunedin 12.31pm) and the second being as is clearly highlighted in the NZPA bulletin that the ODT website is carrying the wave is very unlikely to cause much damage - being mostly less than 1m in height when it comes ashore. That said - DON'T GO TO THE BEACH TO WATCH IT. "It is very important that the public should keep away from beaches and shorelines." Mr Swinney said that people who live in coastal areas should continue listening to More FM, Classic Hits or Newstalk ZB radio stations for further instructions. So often we scientists and skeptics find a lot of fault in journalism for pushing sensationalism or not getting the facts even remotely correct. But it is nice to see that in a serious situation all hands are on deck and working together. So keep a weather ear out for any further warnings and follow any civil defense instructions especially if asked to head to higher ground. The earthquake that caused the tsunami was an 8.3 on the Richter Scale and was centred 205 km south of Apia in Samoa at around 6.50 am this morning (NZDT). It sounds like parts of Samoa were very badly shaken and that there has been some loss of life, so our thoughts go out to those who have lost loved ones, and to those who have lost homes and lively hoods. I am Robert McCormick and I am a doctoral student in physics. In addition to my research I tutor and demonstrate first year physics, and do programming for various researchers about the university. I have an interest in science history and education, as well as the interaction of science and culture.